Skyfire 1.0 is the new kid on the block in the mobile browser war. Its not a kid per se but there are some big boys like Opera Mini and Opera Mobile who don’t give up all too easily. I have been a beta user of it from India since 0.6 😉 and it was fun all this while to keep track of this superb browser. Their main aim is to bring desktop like browsing experience to the mobile browser and they are almost there. So near, yet so far. While watching any videos on youtube, my Nokia E51‘s rear would just heat up quickly & few minutes down, it would be difficult to hold the phone. This problem has been nearly solved in 1.0. That’s possibly due to power optimization techniques. 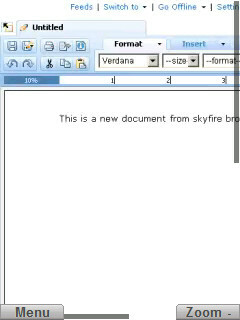 When you scroll very quickly on long web pages, Skyfire usually shows a checkered screen with gray squares (screenshot below), which disappear as and when content appears. Pre 1.0, this checkered screen would take a long time to disappear. With 1.0, this problem has been solved. Same problem used to occur during zoom in/out. Now zoom happens at blazing speed. Neat! Video quality is maintained even during zoom in and zoom out. This was a major drawback in pre 1.0 versions. The initial loading and shutdown of the browser would take a long time in pre 1.0 releases. Not so in this current release. This has been drastically improved. File downloads happens excellently. Kudos for this. This is a major drawback with the E51’s native browser. However, of all the above, the one feature that Skyfire prides itself in is the use of full blown AJAX apps. 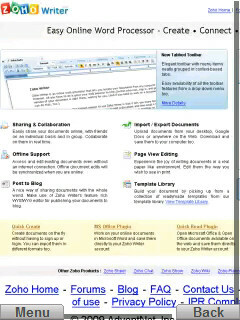 Zoho Writer is an AJAX heavy web application, typically used for word processing on the browser. Since I wanted to test out how well Skyfire performs with respect to Zoho Writer, I fired up http://writer.zoho.com/. The initial login page came pretty quickly. 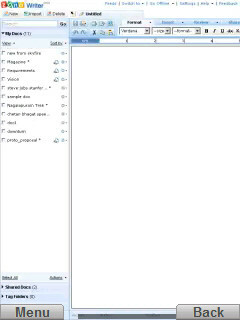 Login was quick and Zoho Writer’s interface loaded up beautifully – as seen in the desktop version. That was a pleasant surprise! I quickly scrolled down and clicked on “Shared Docs” on the left panel. It slid into view by moving towards the top. Then I clicked on “My Docs” again & the shared docs panel scrolled down and away from view. That was another surprise! Along each document in “My Docs”, clicking on the “*” icon brought up the context menu for that document as in the desktop version. Since the context menu was overlapping on the editor, editor took preference to get focus rather than the menu. 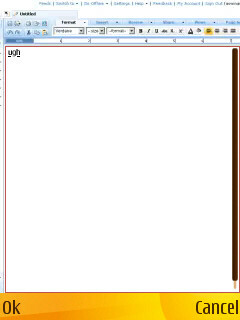 Then I clicked on the editor & in a second, it sprung into action, giving me an editable text area where I can input the document’s contents. 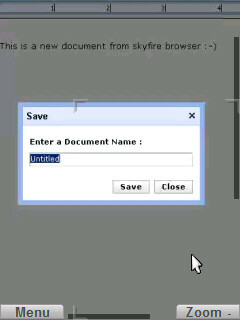 I finished typing some stuff and clicked on the “save” icon. Here’s another surprise. Writer’s modal save dialog showed up. I clicked on save and immediately the “My Docs” panel also got refreshed as on the desktop. Neat! I couldn’t switch between documents. 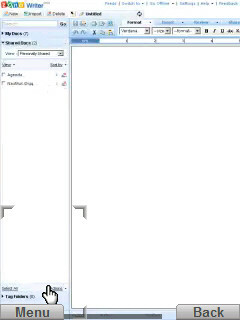 I couldn’t switch between the menus on the toolbar nor could I see the drop down. Deleting documents didn’t happen as expected. 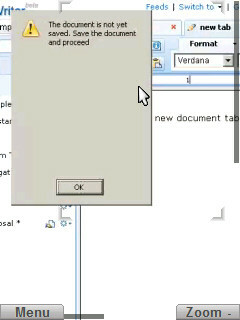 I had to go to desktop browser to delete the selected documents. 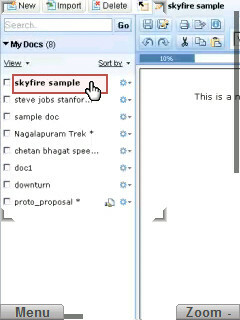 All in all, if you are on the move and if you are using Skyfire, you can use Zoho Writer to create simple documents. You could also use Zoho Mobile to create text documents. But using a full fledged desktop browser version blows you away. I wonder how collaboration works. May be in upcoming versions of Skyfire, you would be able to live collaborate with your colleagues from the mobile phone on the move (when they are on the desktop version). I think this possibility is not far off. 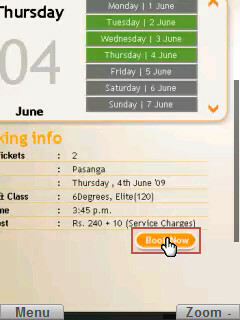 Few months ago, Sathyam Cinemas moved their website from flash to an AJAXified version. Then the world rejoiced because despite Skyfire’s claim of running flash on the browser, you still couldn’t give text inputs that were present inside the flash movies. But now that the site is fully HTML/CSS/JS, it loaded perfectly as in the desktop version. 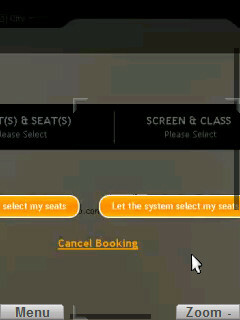 I was able to flawlessly select the movie I wanted, selected a date on the right side, picked a show and then clicked on “Book Now”. 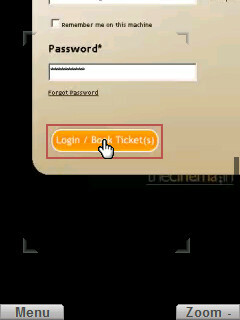 I then gave my username/password and then followed the usual routine of picking up seat, snacks and then clicked on “Pay” button. 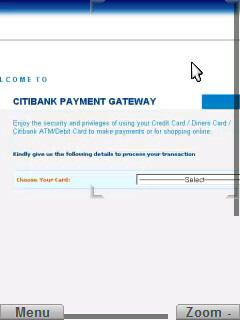 It took me to Citibank’s payment gateway and I roared away to bliss. This is pretty cool I should say. I didn’t face any problem with this website on Skyfire & all stuff just rolled along. Skyfire is here to stay. Check out the screenshots. Thanks to the awesome S60 screenshot software by Antony Pranata! I wonder how HTTPS connections are handled. That’s because I haven’t seen any dialog popup when accessing websites in HTTPS mode. Not sure what exactly happens. 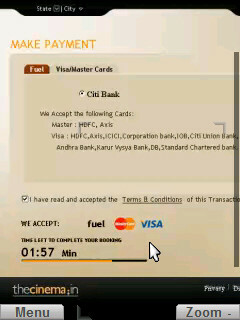 Makes me to be doubly safe with credit cards and email logins. Though there had been substantial power optimizations, Skyfire still drinks battery like water; a little less slowly though when compared to earlier versions. When you are done browsing for about 30-40 minutes, the power charge would have gone down by a point or two. I think this has to be improved drastically. 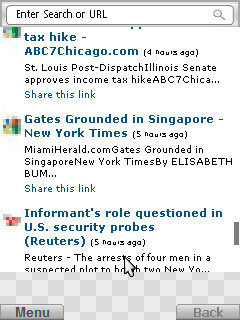 Opera Mini is pretty awesome on battery. Proxy authentication support. Firefox has it, IE has it & so does any self respecting desktop browser. 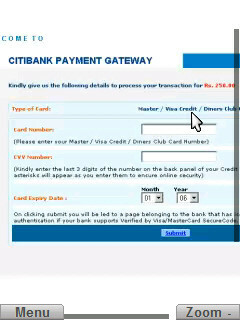 Its high time mobile browsers started offering proxy support with authentication. Speed optimization on GPRS/Edge. GPRS and Edge speeds are pathetic. Even on such speeds, Opera Mini functions very well. But Skyfire doesn’t. 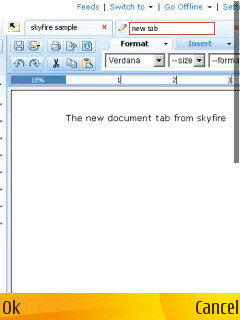 Skyfire should have more keyboard shortcuts. 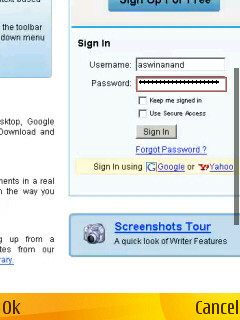 Opera mini has an awesome bunch of keyboard shortcuts. Power consumption. This may take some time to address. But I believe it carries lot of importance. No landscape mode. This should be there too. Landscape mode makes watching videos a pleasure. Save and open web pages from the phone. For me proxy authentication support is a must have thing in any modern web browser. Hope it is brought on soon! hmm… seems pretty good. Have you tried Bolt? Yep. Bolt looks like more like a fat client. Impressive blog. My class mates and I were just talking about this the other night. Also your webpage looks excellent on my old laptop. And thats rare. Keep it up.